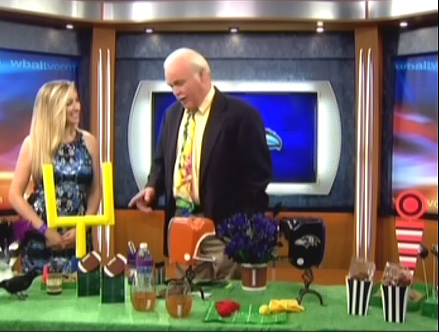 I was scheduled to go onto WBAL next Sunday when the Ravens meet the Texans but the Producer at NBC asked if I could come in today for my Ravens party segment to kick off the Ravens first home game of the season. I had to get to the station at 6:30 in the morning to be on air live at 7:20am. As I was driving past the Ravens stadium, there was already tailgaters setup, grilling, drinking and ready for the game. Those are some serious fans. This entry was posted in football, Media, Recycle, reuse, reuseable and tagged DIY Football decorations, Football, football decorations, football decorations on a budget, football party, Gina Tepper, milk jug helmets, Ravens, Ravens Football. Bookmark the permalink.